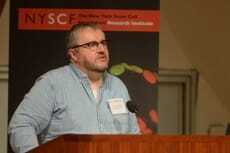 In 2011 NYSCF awarded Dr. Pete Coffey the inaugural NYSCF–Robertson Stem Cell Prize for his pioneering work bringing stem cell therapies to patients with macular degeneration. Now patients in the UK can begin to realize the promises of regenerative medicine as treatments move into the clinic. Dr. Pete Coffey co-leads The London Project to Cure Blindness, which, with NYSCF support, has begun to translate stem cell research into cures. Announced in September, the first patient received treatment for ‘wet’ age-related macular degeneration. The researchers behind the clinical trial used stem cells to create a patch of eye cells, retinal pigment epithelium, to transplant into patients with diseased retinal pigment epithelium. Thus far, the patient remains healthy boding well for this clinical trial to confirm safety and efficacy.